The enormous public backlash to the UC logo change evidences a major problem at your office. Open communication between the Office of the President and your faculty, students, and alumni is being ignored. Whether this was intentional for this rebranding project or an oversight, it is unacceptable. I write you as a senior professor of Art at UCSB, where I have taught since 1992. I have also taught at UC Berkeley, and have served as a visiting assistant at the Davis, Irvine, Los Angeles, Riverside, San Francisco, Santa Cruz, and San Diego campuses. I attended UCLA and received my BA and MFA degrees from UC San Diego. In short, I am both intimately familiar with and acutely invested in the University of California. How an in-house design team can operate for three+ years rebranding the university's visual identity without the university's own Art faculty knowing is beyond me. Our campuses boast internationally renowned experts in the visual arts, design, and criticism. We educate scores of cutting edge MFA candidates each year. My top undergraduate art students are the best in the country. Why were none of us consulted? In this time of budget cuts and clustering, why weren't our own resources tapped? What happened to the UC's esteemed history of self-governance and openness? And who, exactly, oversaw these decisions? My colleagues and I are dumbfounded. My problem is actually less with the final campaign logo and video (which I find vapid and derivative), and more with the way this entire process came to light. The UC sits at a critical crossroads in the public eye and can no longer rely on our historical reputation and prestige to see us through. Yes, the California electorate passed Prop 30, but debate continues on tuition hikes, state pensions, administrative accountability, and the role of state funds in higher education. I know firsthand how important state support is and how valuable and life-changing a UC education can be. We need to present these stories to the public, not get entangled in critical and emotionally charged mistakes like this. 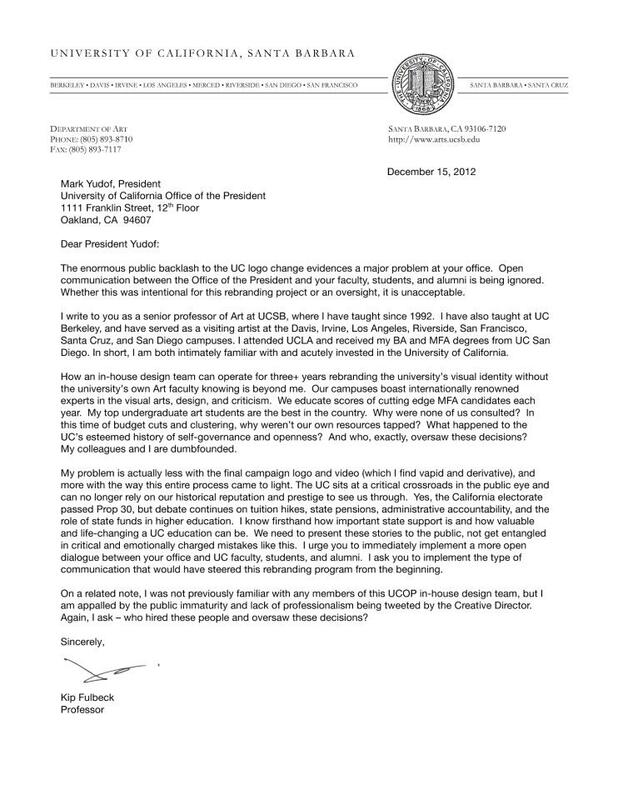 I urge you to immediately implement a more open dialogue between your office and UC faculty, students, and alumni. I ask you to implement the type of communication that would have steered this rebranding program from the beginning. On a related note, I was not previously familiar with any members of this UCOP in-house design team, but I am appalled by the public immaturity and lack of professionalism being tweeted by the Creative Director. Again, I ask -- who hired these people and oversaw these decisions?